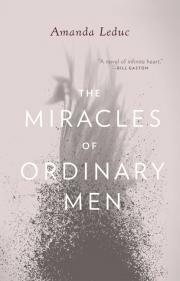 Amanda Leduc’s Miracles of Ordinary Men is a lovely, deeply spiritual novel. What can an English professor who doesn’t believe in God do when he wakes up one morning with angel wings? What else, but ask the Catholic priest from his childhood for guidance, a priest who cooks a mean dish of scrambled eggs but is forced to admit that God’s will is as mysterious to him as it is to the professor, Sam. Along with Sam’s story is that of Lilah, a young woman whose brother wanders the streets of Vancouver and who assuages her guilt by allowing herself to be physically and sexually dominated by her boss. Miracles of Ordinary Men begins with a miracle — Sam brings his cat Chickenhead back to life — and turns into an exploration of belief, guilt and the ambiguity of human potential. I’m not a religious, or even particularly spiritual, person, so it was a surprise to find myself getting really drawn into this book. I credit Leduc’s writing — her language is beautiful, I would even say spell-binding. In describing an experience of physical pain for example, Leduc writes, “She dreams of light that isn’t warm.” I love, absolutely love, that line. A lot may also have to do with my own Catholic upbringing. Leduc’s story took me back to a time when I believed priests and nuns had a direct line to God and could give me the answers I sought. The story also reminded me of the moment when I realized they didn’t know everything, that spiritual searching, the big question about one’s purpose, or God’s plan, is inevitably a lifelong quest, and may never be answered. Even Sam’s angel wings, which propels the story, isn’t an incontrovertible fact — most people can’t see the wings; they only see rips in Sam’s shirt. Yet for this reader at least, the existence of the wings was never in question; much like Catholicism itself, Leduc’s story demands a degree of faith from the reader. Whether the wings exist or not matter less than whether or not you are open to the possibility that they do. Leduc situates her story firmly in this ambiguity, definitive answers always just a bit out of reach, and because of that, achieves a heightened sense of realism, even within a story about angel wings and demons in human form. Despite the presence of angel wings, God’s presence in this story is conspicuously characterized by his absence. Leduc makes the wise choice not to let her characters get too embroiled in discussions about whether there is even a God in the first place. Even the atheist Sam is less concerned about finding a scientific explanation for his angel wings than he is about finding a spiritual one. As a result, the question “Does God exist?” is rarely uttered out loud. Rather, it simmers below the surface — every time Sam asks why he has wings, every time the priest admits he knows even less than Sam does — always, always is the unspoken question, the one the characters, and indeed many believers in real life, may be afraid to even dare contemplate. In contrast, the devil is very much present, commandingly so. In the form of Israel, Lilah’s cruel, domineering boss and lover, evil is as certain and as present in this novel as God is left unclear. Lilah’s sexual relationship with Israel is a metaphor for her own need for penance, and a discomfiting reference to the mostly outdated Catholic practice of penitence through physical mortification. In the Philippines, some people still seek penance through self-flagellation, others through the less extreme measure of walking from one church to another on one’s knees. There’s something liberating in pain, and within the context of assuaging guilt, pain can become almost comforting. Miracles of Ordinary Men is a novel powerful in its uncertainty, realism within the framework of fantasy. It offers no easy answers, nor does it even establish what the questions are. Rather, the story exists in ambiguity, drawing the reader in and asking, if not for belief, than at least for a mind open to possibilities. I purchased this book at the launch in Ben McNally Books, May 2013. Thank you to the author and the publisher for an invitation to the launch. This entry was posted in Book Reviews and tagged 50BookPledge2013, ECW Press, Fiction by Jaclyn. Bookmark the permalink.